A credit-fuelled rampage. So much for encouraging personal savings. What a world. 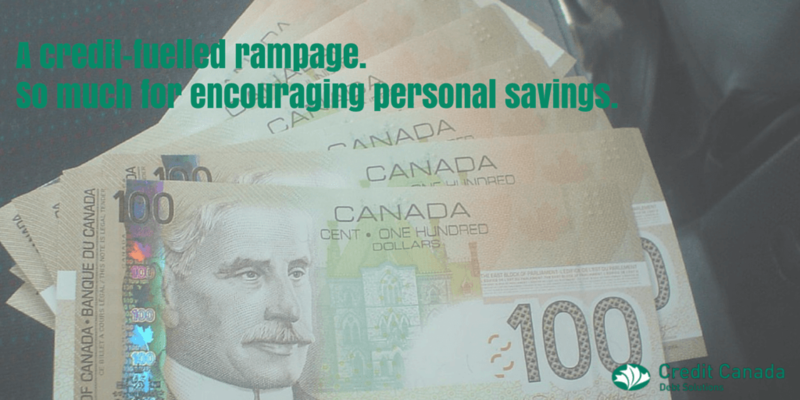 Just blink, and suddenly more economic news surfaces to dampen the outlook for more personal savings amongst Canadian consumers long in the throes of a credit-fuelled spending rampage making credit counselling more important than ever before. Just a couple of weeks ago, market analysts and financial bloggers – including me – weighed in on forecasts for a possible hike this year in Canada’s benchmark bank interest rate. It’s a development that could boost the cost to consumers of variable-rate mortgages and lines of credit. I pointed out it could end up straining the finances of many Canadians, so we all had better think twice before racking up more debt. But then suddenly within days, more bank-rate news followed the forecast discussion. The Bank of Canada announced not a hike but a quarter-point drop in its base rate – as if the lure of today’s cheap credit isn’t enough to discourage personal savings. Following news of the base-rate drop, I weighed in again at the invitation of CBC TV’s The National. In essence, I said that a lower base rate leading to lower commercial bank rates sends the wrong message to consumers. It encourages more debt spending at a time when Canadians are already chin-deep in what they owe. For every dollar that individuals make in this country, they owe a dollar sixty-three. It’s a record high reflecting about the same income-to debt ratio we saw in the United States at the time of the 2008 crash. I told CBC further, in so many words, that Canadians must be very cautious about their spending right now. Market analysts agree the country is experiencing a real estate bubble that at some point is bound to pop with the potential for a big drop in property values. Is encouragement to spend more at this time at all wise? Our credit counsellors advice is to pay off your debts not take on more. How many Canadians will find themselves in a negative cash situation with a home because they borrowed as much as you could, with the lure of putting very little down for what amounts to costlier, longer-term debt? How many Canadians will regret taking out lines of credit for pricey pleasures and tall ticket items like new appliances, furnishings, home renovations – what have you – only to find out soon enough that they can’t meet their monthly nut? I have to say, Canada remains an affluent country, and in that affluence we as a people simply have allowed our spending to get out of hand. We want too much. We lack patience, discipline, and training in relation to managing our personal finances frugally. If we had our druthers, we’d all be saving much more and planning wisely for both the short term and the long term. Let’s just remember, BMO research shows that almost a third of us are living paycheque to paycheque these days. Almost 20 per cent of us have less than $1,000 set aside for a rainy day. You know, in the midst of all this fickle financial news, another news story presented itself last week that touched me and which I think serves as a humbling lesson to all of us in Canada. BBC news told of a man named Santosh from a small village of 200 people in north-east India. Santosh lives with his wife in a modest, two-room hut that doubles as his workplace. Here he plies his trade as a tailor, making three to four dollars a day. For the past ten years he’s been saving up to buy a new fridge. Finally that day came. It is not only Santosh’s first new fridge but the very first fridge ever to appear in his little community. When the fridge arrived, folks from throughout the village gathered to celebrate the occasion. Of course, Santosh’s wife was overjoyed at the prospect of being able to store fresh food and drink cold water. Imagine that, my fellow citizens, as you ponder your approach to personal savings.